Every year it goes the same way. My mom calls me up a few weeks before Thanksgiving and asks me, “You are bringing green bean Casserole this year, right?” before she launches into a chorus of “You have to! No one else makes it just like you do!” Green beans have become “my thing” around the Thanksgiving holiday, and it’s the dish that I am expected to bring to dinner each year. I don’t mind though. I sort of love green beans…and when you top ’em with fried onions, creamy mushroom sauce and my [not-so] secret ingredient, bacon, it’s a taste explosion that I really can’t resist! Stir the soup, milk, soy sauce, black pepper, beans, bacon and 2/3 cup onions in a 1-1/2-quart casserole. Bake for 25 minutes or until the bean mixture is hot and bubbling. Stir the bean mixture. Sprinkle with the remaining onions. I always buy my green bean casserole ingredients at Sam’s Club because I have a huge crowd (usually around 35 people) to feed at Thanksgiving. If your family isn’t as large as mine, and you have leftovers, you can find a bunch of great recipes built around the three main ingredients by clicking on the image above. They all sound tasty! So what are you making for Thanksgiving this year? 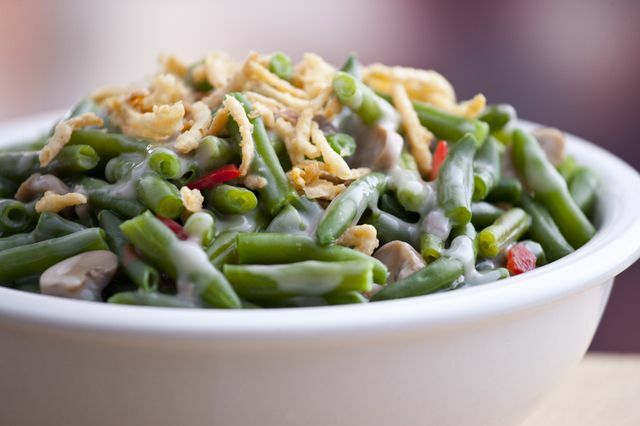 Are you a green bean casserole fan? Do you keep it classic or give it a modern twist? I’d love to see your recipes and add them to my Pinterest boards, so be sure to leave me a link in the comments!